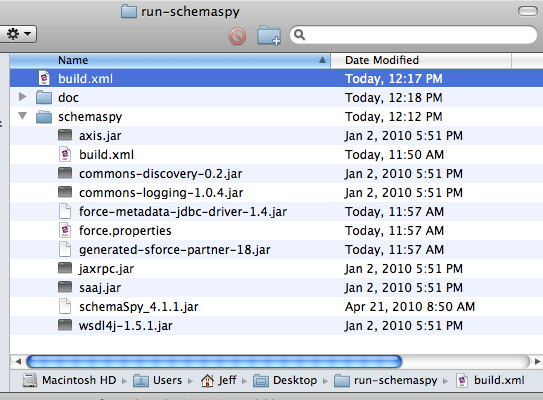 The Force Metadata JDBC Driver for SchemaSpy is a really cool tool available at Force.com Code Share that generates ER diagrams for your Salesforce org. Some people have emailed me asking for help installing and running the tool so here are some instructions that supplement what is listed on the project's wiki page. 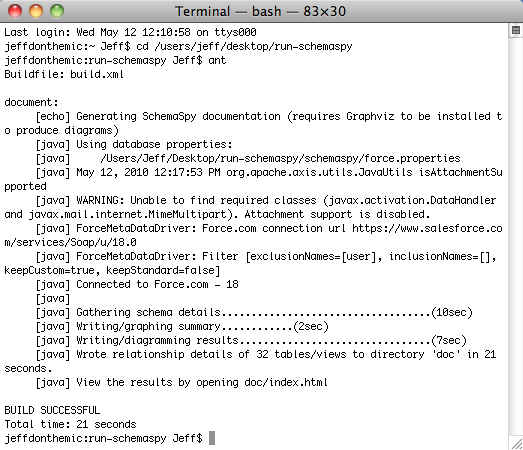 You'll also need to download the schemaSpy_4.1.1.jar file from the SchemaSpy files page and install Graphviz so it can generate the graphs. There is both a Mac and PC version. The Partner web service is pointing to www.salesforce.com. If you want to generate your ER diagrams against a Sandbox org, you'll have to make some modifications as outlined on the wiki page. I also created a build file which I dropped in that same directory. Make sure you add your Salesforce username and password/token. You should then be able to open up a terminal, navigate to the directory on your desktop and run ant using the build file (assuming ant is installed correctly). Your terminal should look like the screenshot below. The script will create a doc directory and generate the ER diagrams in this directory. Simply open index.html file in the doc directory and you are golden!